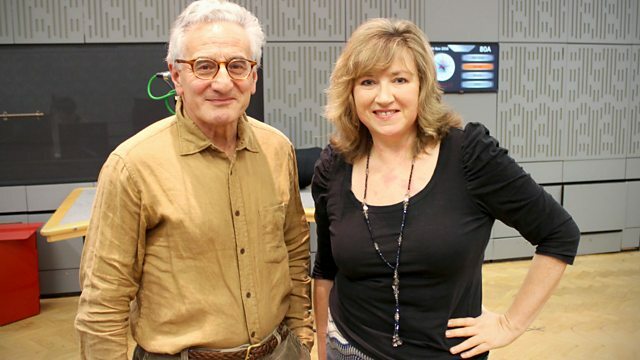 Suzy Klein's guests include actor Henry Goodman and conductor Adrian Chandler. Plus live music from pianist Lucy Parham and folk musician Seth Lakeman. Suzy Klein with a lively mix of music, chat and arts news. Her guests include actor Henry Goodman, conductor Adrian Chandler, with live music from pianist Lucy Parham. Plus renowned folk musician Seth Lakeman performs live in the studio. Radio 3's 70th season, celebrating seven. Performer: Lucy Parham. Performer: Henry Goodman. Performer: Crispian Steele‐Perkins. Performer: Stephen Keavy. Ensemble: The Parley of Instruments. The Birth of the North Italian Violin Concerto 1690-1740. Performer: David Plantier. Ensemble: La Cetra Barockorchester Basel. Director: Václav Luks. Mozart: Piano Concertos 17, K453 & 25, K503. Choir: Christ Church Cathedral Choir, Oxford. Ensemble: Oxford Baroque. Performer: Alisa Weilerstein. Orchestra: Bavarian Radio Symphony Orchestra. Conductor: Pablo Heras‐Casado. Shostakovich: Cello Concertos Nos. 1 & 2.